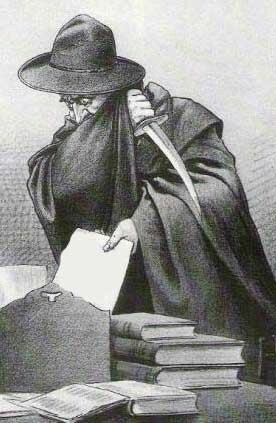 WHO-Named "Jack the Ripper" from a letter written by someone who claimed to be the Whitechapel butcher, published at the time of the attacks. WHAT- An infamous murderer Jack the Ripper that killed at least five London female prostitutes. Who was never captured and his identity is one of English's most famous unsolved mysteries. WHERE- All of his murders took place within a mile of each other, and involved the districts of Whitechapel, Spitalfields, Aldgate and the City of London- in London's East End. WHY No one knows why but he would mutilated their bodies in an unusual manner, indicating that he had a knowledge of the human anatomy. Also sent letters to the London police taunting them because he could not be caught. HOW- He would target prostitutes late at night. Where then he would take them to an enclosed area to kill them. At the time of these murders in 1888 the media was portraying this incident to warn others to watch out and be careful. Now the media is portraying this as one of the world's greatest mysteries. Their is a movie and a character based off of this individual creating a mystery story out of it. The first article that I read said that they were able to identify who Jack the Ripper was through DNA testing, on a piece of shawl found on one of the victims. This is bias in that the evidence found on the victim could have been from anyone that they made contact with. It doesn't mean that it came from Jack the Ripper himself, so their evidence is partially bias on the fact that they think it came from Jack himself. The second article talked about how in 1888 it was a bad year to be a prostitute in London. It noted the terrible murders that he did and was bias by saying all of his acts were wrong. The first criticism would be historical. Dates back all the way to 1888 and the methods used to find murders were not as advance as they are now. In today's world the chance of this happening without that person being caught is very minimal. The second criticism would be cultural. Anytime their is a serial killer in the area it brings a great deal of paranoia. People were at high alert and the police were on extended hours and working in a big collective group to try to solve this mystery. "WELCOME TO JACK THE RIPPER 1888." Jack the Ripper. Web. 4 May 2015. "Casebook: Jack the Ripper - Introduction to the Case." Casebook: Jack the Ripper - Introduction to the Case. Web. 4 May 2015.